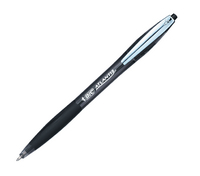 Bic Atlantis Premier Ball Point Pen 1.0mm Black 902133. Classic design. Cushioned grip. Vivid, consistent and super smooth ink. Approx Dimensions (CM): D15.5 W7.5 H3.5. Approx Weight (KG):0.123.